LLJA & friend, from Germany, July2014 : The writer´s home is just a lovely place. Tasty, natural, cosy and clean. Close enough but not too close to the lively harbor of Livadi. And Serifos is worth a trip anyway. Gorgeous landscapes and a breathtaking views. And last but not least: Paradisial beaches! Vici is a super kind, open minded and interesting person, very helpful but not intrusive at all. We´d love to come back! DANIEL & friend, from Spain, July 2014 : Nice cottage in one of the most quiet and beautiful island of the Cyclades. It is situated near a wonderful beach (Karavi) and you almost don’t need anything else apart of the amazing sourranding and the intimate beach. It is a short distance from the town (15 minutes walk) and other beaches more crowded like Livadakia (10 minutes walk). Very near (3 minutes walk) there is a traditional tavern (Kabia) with delicious homemade food and a very good treatment (I will miss Alexandros!!!). Don’t worry if you don’t drive or you can’t rent a car. The local bus and the taxi services work quite good and you can visit amazing places like Hora and Agios Sostis beach. Referring to the house, it has been decorated with a traditional style and you feel confortable from first moment you are in. It seems quite small but there you can cook you find everything you need. Don’t miss read or have dinner in the beautiful terrace. The owner, Vici, was very charmed. She was really very kind with us attending our needs. One night we have the opportunity of chatting with her drinking a glass of local wine… It was a real pleasure to have met her and his friend (and Sarah, his dog!). Awesome place! FRANCESCA & ALICE, from Italy, September 2013 : It was a beautiful experience our stay in the Guest house of Vici:) It’s a fairytale place, clean, cozy and equipped with everything that we needed:) first of all silence, and then the amazing blue sea of Serifos in front of the house. It’s a very romantic place, perfect for a couple. And Vici is a beautiful woman and person, warmful and always kind and generous and i don’t know a lot of words in english, but she really is a beautiful host. Hope to see you again Vici. Hope to see you again Guest House. Hope to see you again Serifos:) Big big hug from us. SOFIE’s family, from France, August 2013 : La maison de Vici est magnifique de simplicité et de raffinement. C’est en endroit plein de charme et d’ âme à l’image de Vici qui est tres accueillante et chaleureuse. Une belle decouverte, une belle rencontre. Séjourner ici est un vrai bonheur. Hautement recommandé. MEGAN, from Britain, August 2013 : Vici is an absolutely fantastic host, and her house is an absolute dream. I had a gorgeous two weeks in Serifos, but feel like I could have stayed for months. The island is sublime, and Vici’s hospitality knows no bound. I couldn’t have hoped for a better place to think and write and dream – thank you Vici! I hope to come again. ELENI & JOHN, from Greece, August 2013 : Spend 3 wonderful days in this absolutely great little guest house! Vici is the best host one can have: both there, when you need her and not there when you want to feel private! Vici really took excellent care of us, both in providing information and practical support. All of her interactions with us, the printed or on-line ones as well as the oral f2f ones, were of the sweatest and most good-hearted nature! Her guest house is beautiful, cool even in the warmest hours! Great to return to after a day in the sea and sun. It is one of those places that you want to spend more time in… The location is great! The beaches we visited: amazing. Overall this rental is a great alternative to the mostly sterile and often boring rooms found in hotels or “rooms to let”: this guest-house has managed to capture and recreate the local color of the island which marries aesthetic simplicity with the beauty of the simplicity of living! Can’t wait to go back! ZORANA & PEDJA, from Belgrad, June 2013 : We enjoyed our stay at Vici’s place as we enjoyed Serifos. Actually, her writers home and the island are extraordinary connected in simplicity of the nature, details that are joy for eyes, hospitality and feeling that you are accepted and welcome. The special and secret spice was wonderful teenage female labrador Sarah, with big, strong hugs for us every day before and after exploring the island. Thank you Vici (and of course Sarah) for one of the unforgettable holidays that we have so far. ANNE-SOPHIE & EMILIO, from Switzerland, June 2012 : La maison de Vici est un rêve construit avec amou; elle est entourée d’un magnifique jardin méditerranéen haut en couleurs et en odeurs!!! L’accueil de Vici est aussi chaleureux que le soleil de la Grèce et pour finir Sérifos est une île qui mérite absolument d’être découverte!!! Nous avons passé quinze jours, nous regrettons déjà de n’être pas resté plus longtemps!! Mais nous reviendrons!! Encore merci à Vici pour son accueil et sa disponibilité!! FRANCOIS’ family, from France, August 2011 : Vici has arranged a very nice studio next to her beautiful house. It is built in traditional local stones, with a very Cycladic look. It is clean, protected from the wind, and always fresh (which is appreciable in summer!). The studio is located 5 minutes walk from the small and nice Karavi beach. There is a very good taverna 5 minutes walk (the other way). 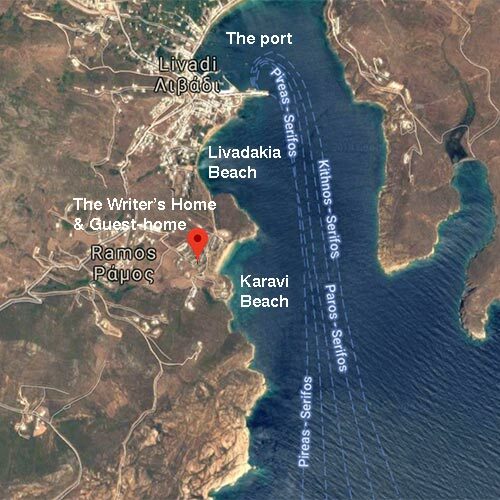 And you can reach the Livadi port and the very animated beach of Livadkia within 15 minutes walk. We had a very nice stay there. the island is beautiful, the beaches are gorgeous and Vici is so helpful ! She knows everyone on the island (she’s been living here for 20 years) and helped us in many ways in organizing our trip.